Last week, I ran over to the produce house to buy a case of organic on the vine tomatoes to make roasted tomato soup. Today, our oldest is turning 10 - the whopping double digit birthday! No longer am I the mother of only little kids. How exciting, and how sad. It really does go by in the blink of an eye!! It is just past midnight as I am typing this, and I only just now finished decorating the main area of the house. As I was doing that, I started wondering how many times before I had decorated late at night, after also doing my regular chores, wrapping presents, and working on last minute preparations. That would be 30 between all the kids - thirty birthdays complete with parties, decorations, special meals, gifts, cake, and the whole nine yards. And to think our oldest is only ten. Wow, funny how a birthday here and a birthday there adds up so quickly. My apologies for still not having answered all the questions from the Q&A back in May. To see my previous posts on this, please click the Q&A label. Yesterday, as I was yet again dealing with a mess caused by one of the children, I was trying to figure out why taking care of children can be so wearisome even though I love them so much and would never rather do anything else. Then it hit me - as mothers, we are always the ones fixing everything, getting it back in the "right" condition. We have been having such a great homeschooling schedule this year. The boys are now old enough to work without constantly distracting each other. Plus, now that I have more "students" than kids who mostly just play, the older ones aren't just constantly trying to sneak off and get out of working because their younger siblings are playing. Make no mistake, they really are not overworked and deprived of time with their younger siblings - they have all of their "seat work" (i.e. boring Math and English worksheets and books) done before lunch every day, leaving our afternoon time for the funner, more hands-on interactive subjects such as history, science, geography, German, art, etc. 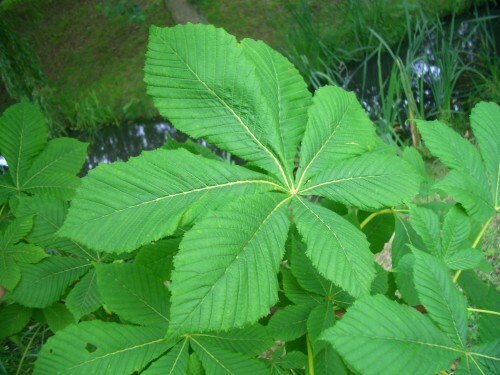 Dear readers near and far, do you happen to have horse chestnut trees where you live? Some of you may have heard me talk about Bountiful Baskets before. We have been participating in their produce co-op for at least three years now. In the last year or so, it sadly has become very disappointing in terms of quality and quantity. Last week, I explored the option of instead starting my own "mini co-op" with local friends that I know are into healthy/organic eating. Many of these I know from being a drop site for Azure Standard, another great co-op we get most of our groceries from. Sometimes people ask me where I get all the energy I seem to have, or how I have time to do this or that. Personally, I don't think I have unusual amounts of energy, nor do I get everything done that I need or want to. But, working slow and steady, I often find myself surprised at all the stuff I got done once night comes around. Of course, there is always more that DIDN'T get done than what did. So I am not writing this because I am some sort of authority or source of special wisdom on this question. These are just some tips that someone else might benefit from. Did you know it was my 4-year blog anniversary yesterday? No? Well, that's okay, because I forgot about it, too. Today, something new and never seen before: a VIDEO tutorial! My apologies about the sound, because it came out much too quiet, but if you turn your speakers all the way up it should work. Maybe later I have time to fiddle with it and figure out how to amplify the sound. Whew, can you tell I have been busy? You know I have too much on my plate when I no longer even have time to blog. This being my last and only hobby, when I don't have time for that, it means I am working all day, every day, without so much as a break. Our first day of homeschooling went very well today. For those of you who are interested, I will give a brief re-cap of the day, which was actually a very typical day for us. While I don't have a set minute-by-minute schedule, I do follow a certain pattern every day. NOT Back to School for us is tomorrow. I refuse to start a new school year before September. It's just not right. Starting any sooner would be like celebrating Christmas in November.The kids are excited. Miriam kept telling me today, "I'm so nervous! I don't know if I can do it! Maybe it's too hard!" She is going into K-5, for crying out loud, and she has a very gentle and slow-paced curriculum. She has a tendency to agonize over little things. Thankfully, she is learning in the safety of our family. Today, the last day of summer break, I finally finished writing the lesson plans for this year. That usually takes all my spare time for a couple of weeks. Yesterday, I spent a solid two hours agonizing over just what new German books to order the kids from Amazon in Germany - does that count as planning? Oh, what would I do without access to books and materials from the Old Country??? Click on image to enlarge, click again to enlarge even more. Mix all ingredients in a large bowl. Store in an airtight container. Makes about 4 cups - 1/4 cup equals a packet of store-bought taco seasoning. Tastes great for making tacos, taco soup, fajitas, burritos, etc.